In the world of science, DNA is a recent discovery. In the world of game development, XNA is even newer. Simply put, XNA is an easy-to-use software suite. It lets you make games for both the PC and Xbox 360. First announced as an initiative at the Game Developers Conference in 2004, the project was led by J Allard. By the end of 2005, the proof of concept was up and running. At the 2006 GDC, Microsoft released the completed XNA framework. XNA makes game development more accessible. "It's really about providing the same tools, the same libraries, the same capabilities of both platforms," says Dave Mitchell, Director of XNA's marketing department. "So you can write your game once and have it run on both platforms. The real sweet spot is casual games." It all started when Microsoft decided to build their technologies specifically with developers in mind. Mitchell says XNA came about when Microsoft realized the small-time developers, people new to development, were encountering "the 'country-club mentality.' You sort of have to know someone to break in [to console development]." 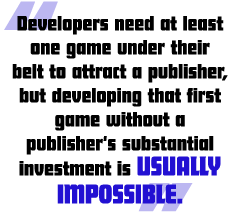 It's a big catch-22: Developers need at least one game under their belt to attract a publisher, but developing that first game without a publisher's substantial investment is usually impossible. "We just saw all of these complexities and challenges," Mitchell says, "among indies, hobbyists, students, university settings, in particular, of building a pipeline of creativity to come into the industry." After identifying that problem, Mitchell recalls looking across the rest of Microsoft for answers. "One of the things we take great pride in is really engaging with the hobbyist and enthusiast level with a lot of our technology and arming and equipping them." Visual Studio Express serves as one example. "We really then set off to see what we could do to open up the Xbox 360 as a console," he says. "We were asked internally, can you make games on Windows? Sure, check. Can you do that on a console device? No, you really can't without getting thousands and thousands of dollars in equipment. And, of course, getting an agreement in order to get to that point." So, in the beginning, the XNA team wanted to democratize game development. XNA represents the first time in the 31-year history of console gaming that retail units are also development boxes. Of course, when you open up game development to anyone, the result isn't always something Microsoft wants its name on. People can create anything from AO-level games to games that violate any number of copyright laws. Mitchell says they're hoping to address the problem gradually. For example, in XNA version 1, online play was disabled, though they plan to slowly introduce it over time. What XNA means, is a much greater number of people are going to give game development a go. "If it's not only accessible, but we're doing the right things, hopefully the rest of the industry jumps on board."